Swathes of snowdrops attract early spring walkers and perhaps the most northerly of these is at Binscarth wood on the Orkney mainland. One of Orkney’s most beautiful woodland walks can be found just outside the small village of Finstown. Binscarth Wood was planted in the 19th Century and is a unique seven and a half acre woodland. The walk through the woods can be a little challenging, being a it wet underfoot but the reward of seeing the snowdrops in March and later the bluebells is well worth the visit. Planted with sycamore, ash, beech and hawthorn, the woodland is home to birds and wildlife and makes a refreshing break from the vast expanses of flat heathland. Perhaps this is the most northerly snowdrop walk in the UK…let us know if you know differently or send us your images using the comments link at the end of this post. 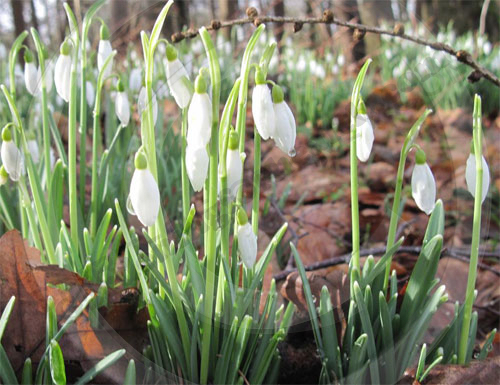 Orkney Communities – Picture of the snowdrops at Binscarth Wood taken on 8th March 2010 by Stewart Campbell. Flikr – Binscarth Wood Snowdrops 2008.